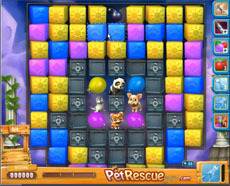 The strategy in pet rescue #487 is to destroy with the bombs that fall above the screen the wire creator machines and the metal boxes under the pets. To do it use, for one more level in this episode, the mesh mash booster it gets activated while clearing the blocks, to destroy the wires that protect them. After you’ve done this, to clear out the blocks under the pets is a piece of cake. In case you find Level 487 pretty hard you should watch our video!